EyeConnect is a media server application. By scanning your network for UPnP AV digital media devices, it can detect any available device to which it can serve multimedia content, and thus share all your Mac's video, TV, music and photo content with your TV or stereo. Compatible with pretty much any media content (including DivX, Xvid, WMV, JPG, iTunes library etc. ), EyeConnect will set you up with a media center in minutes. After installing the program, setting it up to work with your UPnP device is a snap. It detected our test device (a Sony PlayStation 3) instantly and immediately allowed us to start viewing content on our TV set, a much better installation experience than we had with some of the other options in this category of software. EyeConnect offers a fairly simple, clean-cut preference pane for managing its features. Most features can't be adjusted while the server is running, so you'll need to stop it while you play around with the settings. All the obvious options are there, such as the port to send your traffic through, a list of recognised UPnP devices (from which you can allow or deny individual entries), and a section where you can choose which folders may be shared with your network device. More interesting are the available options for enabling and disabling certain plugins for the server. Some of these allow for easy folder browsing, maintaining the structure of your iTunes library on your networked device etc, but others allow for on-the-fly transcoding of certain file types. The program only includes two transcoding plugins (and we haven't yet been able to find any more), but this is a really interesting feature which could well extend the functionality of your UPnP device. EyeConnect is a simple media server which is a snap to install and even easier to use. Highly recommended as an option for extending your digital life. Essential software for Mac and PS3 owners. 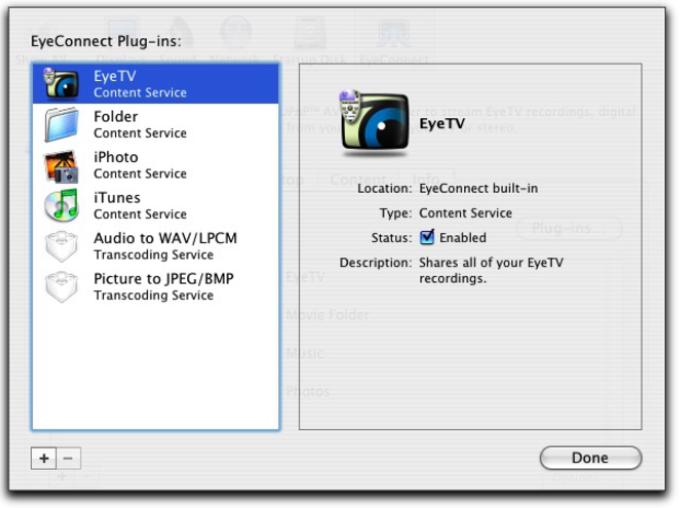 EyeConnect software enables your UPnP™ AV digital media device to stream EyeTV recordings, digital photos, music and movies from your Mac onto your TV or stereo. EyeConnect is based on the globally trusted Universal Plug and Play™ Audio/Video standard (UPnP™ AV) for the seamless sharing of digital content throughout your home. 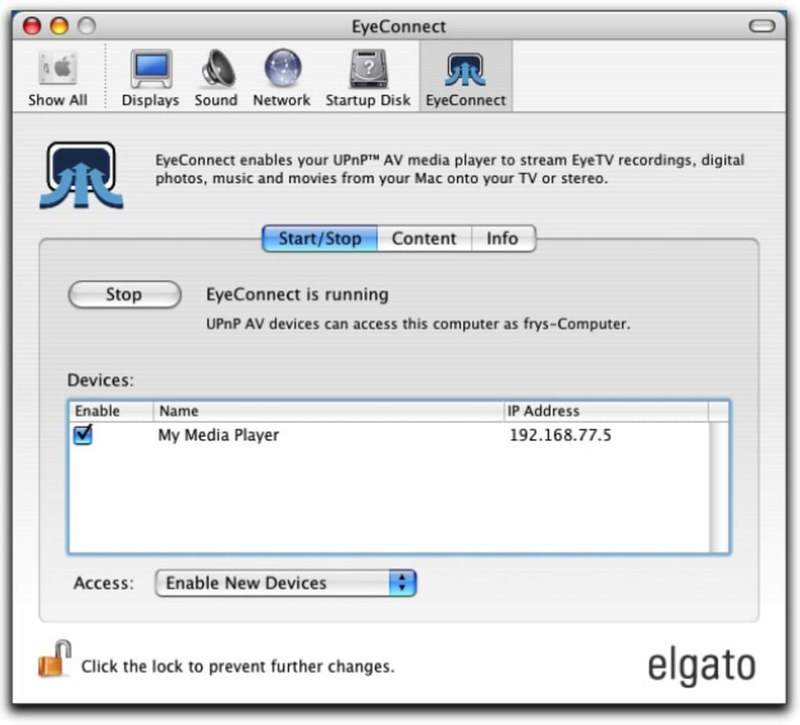 Using this industry standard technology, EyeConnect enables a broad range of UPnP™ AV devices to play EyeTV recordings, digital music, video, or photo content, including iPhotos®, iTunes®, and movies stored on your Macintosh. 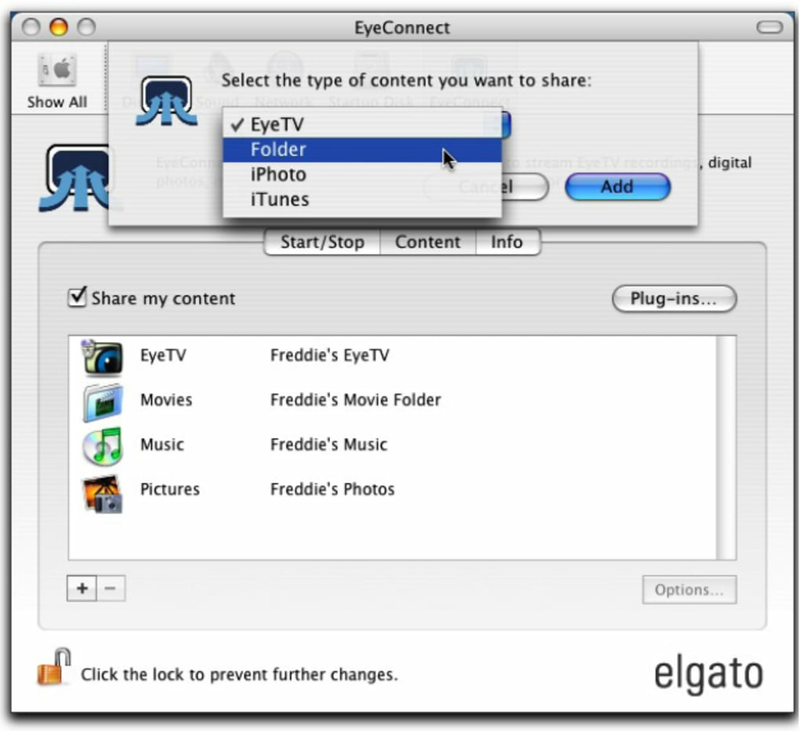 Elgato’s EyeConnect digital media streaming software addresses a rapidly growing market for home networking solutions for the Macintosh. Use EyeConnect in combination with your UPnP™ AV digital media device to manage wired or wireless streaming of digital entertainment content effortlessly. Digital media files remain organized as originally stored in your Mac libraries so you can quickly find the file you want. App has promise but don't expect support. Decided to move media serving off of Vista onto a spare Mac (MacBook) to simplify things. I had EyeTV on another Mac (MacMini) that had been used as a media center, but had been shutdown. Install EyeConnect trial on MacBook. Configured and running okay. Streaming to LG BD390 and PS3. Did take a while after setup before media showed up on streaming devices, but ok. Exactly 30 days later no streaming. Since the MacMini wasn't being used I removed EyeTV from it and used the key for EyeConnect to activate. Seemed to be ok. Few days later did an update to the MacBook and when it came back up no activation. So I think maybe this serial only works with EyeTv. Ok, I go buy a license for standalone EyeConnect. A note here it took 2 days to get the serial for the purchase. That seemed absurd to me, nearly every online purchase I've made has sent the serial with a few hours (if not minutes). Okay after much negative from family, finally get serial installed and back up and running (again takes some time). Exactly 30 days later, nothing again. So I reinstall the code, looks okay. I go ahead and do some OS updates since the system is down-ish and when it comes back up, not activated. Rinse and repeat installing code. Finally after trying to find anything on Elgato's website I submit a ticket. As a note on the website, the FAQ is basically marketing content and nothing in the forums. Six days later (yep 6!!!) I get a response saying because of the holiday it would be at least another 5-6 days before my issue would be looked at. In all my years using Macs this is the worst example of product support I've ever seen. I consider my EyeConnect purchased flushed and Elgato has been placed on my &quot;never again&quot; list for purchase or recommendation. Has promise and when it worked it was good. Stopped working too easily with no warning. Eyeconnect 1.6 crashes. The features looks very promisine, but the application is badly tested. It crashes constantly with a SIGBUS on Leopard 10.5.8. After crashing it automatically restarts and crashed again. 10 libSystem.B.dylib 0x927af012 thread_start + 34. Features look promising, GUI is fine. What do you think about EyeConnect ? Do you recommend it? Why?